Join us on Wednesday, June 10 for AALDEF’s Annual Summer Cocktail Party at Motivo, 915 Broadway (at 21st Street). Raffle, hors d’oeuvres, cash bar. Party for a cause! Meet Asian American lawyers and young professionals. All proceeds will support AALDEF’s legal and educational programs. 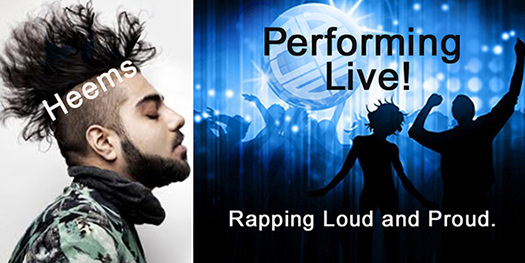 Special live performance by Indian American rapper Heems (Himanshu Suri)! He will perform songs from his critically-acclaimed new album “Eat Pray Thug.” Heems has been featured in The New York Times, The Village Voice, and NPR. Tickets: $60 (advance), $50 (nonprofit/student), $65 (at door). Jasmine BallDebevoise & Plimpton LLP Anirudh Bansal Cahill Gordon & Reindel LLPTerri-Anne Segovia CaplanRopes & Gray LLP Kirby Chin Schulte Roth & Zabel LLP Kunal Dogra Proskauer Rose LLP Joseph D. Eng King & Spalding LLP Chao Huang Cadwalader, Wickersham & Taft LLP Inventus Stephen Kam Shearman & Sterling LLP Wan-Mo Kang Fox Rothschild LLP Richard K. Kim Wachtell, Lipton, Rosen & Katz Nicole LaMontagne Paul Hastings LLP Christine I. Lee Jenner & Block LLPSteven LiangSidley Austin LLP Christine J. Lim Credit Suisse Gary T. Lo Davis Polk & Wardwell LLP Raymond T. Mak Epstein Becker Green Mayer Brown LLP Chantel Moore Dechert LLP Palash I. Pandya Akerman LLP Quinn Emanuel Urquhart & Sullivan LLP Teena-Ann V. Sankoorikal Cravath, Swaine & Moore LLP Leah Shen Simpson Thacher & Bartlett LLP Netra Sreeprakash Kleinberg, Kaplan, Wolff & Cohen, P.C.Stroock & Stroock & Lavan LLP Madeleine Tan Kaye Scholer LLP Krishna Veeraraghavan Sullivan & Cromwell LLPKim A. WalkerWillkie Farr & Gallagher LLP Timothy Wilkins Freshfields Bruckhaus Deringer US LLP Ha Kung Wong Fitzpatrick, Cella, Harper & Scinto Dino Wu WilmerHale Jennifer H. Wu Paul, Weiss, Rifkind, Wharton & Garrison LLP Dwight S. Yoo Skadden, Arps, Slate, Meagher & Flom LLP Andrew J. Yoon Weil, Gotshal & Manges LLP Brian Youn Milbank, Tweed, Hadley & McCloy LLP Joyce Young Baker Botts L.L.P.